Less than a year after B2Gold Corp. (TSX: BTO; NYSE-AM: B2G) declared commercial production at its 80%-owned Fekola mine in southwestern Mali, the gold producer has updated the mine’s resource estimate. Based on about 192,000 metres of exploration drilling in 928 holes, B2Gold estimates Fekola now contains 92.81 million indicated tonnes grading 1.92 grams gold per tonne for 5.73 million ounces of contained gold and 26.50 million inferred tonnes averaging 1.61 grams gold for 1.37 million oz. gold. The new resource is contiguous to the north of Fekola’s current reserve pit boundary and extends the resource pit boundary 1.2 km and was based on about 192,000 metres of exploration drilling in 928 drill holes. The resource was reported within a pit shell a gold price of US$1,400 per oz. gold and a cutoff grade of 0.6 gram gold. Pit shells using a lower gold price of US$1,250 per oz. contained 90.67 million indicated tonnes at 1.94 grams gold for 5.67 million oz. contained gold and 16.62 million inferred tonnes of 1.58 grams gold for 844,000 oz. contained gold. B2Gold says it will continue exploration drilling to the north and west of Fekola, and at the Anaconda zones about 20 km away from the mine. An expansion study based on the updated resource is also underway to assess expanding mill throughput from the current average of about 5.5 million tonnes per year to 7.5 million tonnes per year. The study should be finished before the end of the year. 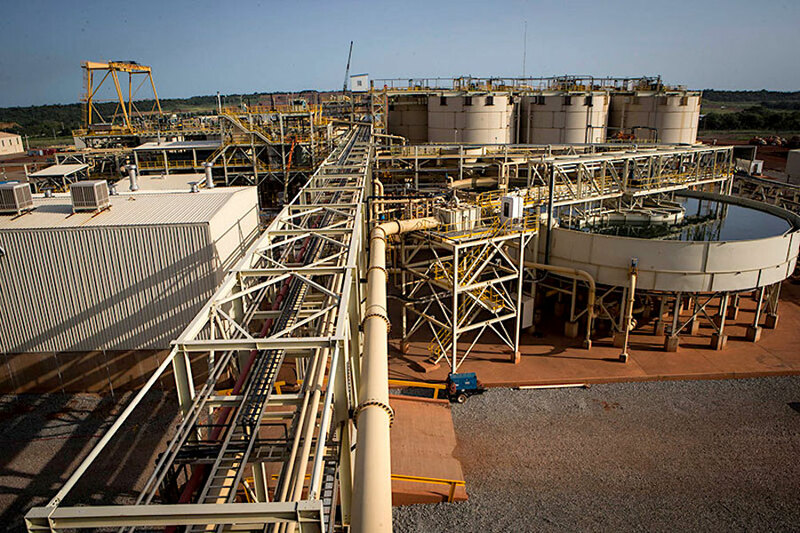 The company expects Fekola will produce between 420,000 and 430,000 ounces of gold in 2018 at cash operating costs of between US$345 and US$390 per oz. and all-in sustaining costs of between US$575 and US$625 per oz. B2Gold has five operating gold mines (two in Nicaragua, two in Africa (Mali and Namibia) and one in the Philippines, and forecasts it will produce a total of between 920,000 and 960,000 ounces of gold this year, about 300,000 ounces more than it did in 2017. Management forecasts consolidated cash operating costs of between US$505 and US$550 per oz. and AISCs of between US$780 and US$830 per oz.